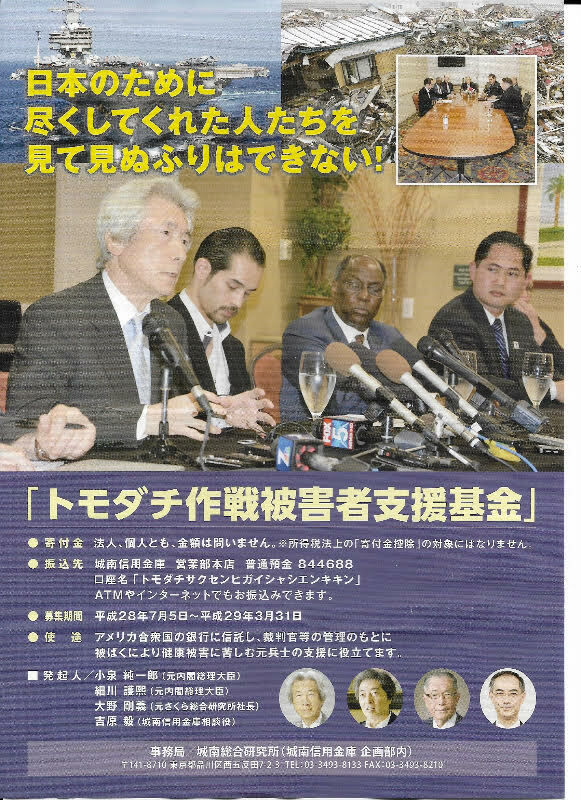 Former Prime Minister Junichiro Koizumi is calling for donations to the relief fund he founded for U.S. veterans who claim their health problems resulted from radioactive fallout after the 2011 nuclear disaster. More than 400 veterans who were part of the Operation Tomodachi mission to provide humanitarian relief after the Great East Japan Earthquake and tsunami have filed a mass lawsuit in California against Tokyo Electric Power Co., operator of the crippled Fukushima No. 1 nuclear plant. They are seeking compensation and an explanation for their health problems. However, in a 2014 report released by the U.S. Defense Department, no link was established between radiation exposure and their ill health. The reason cited was that only a low level of radiation exposure occurred. ” YOKOTA AIR BASE, Japan — A former Japanese prime minister is calling on his countrymen to donate to a fund for U.S. veterans who say they were sickened by radioactive fallout from the 2011 disaster at the Fukushima Dai-ichi nuclear power plant. ” Japan’s Abe administration is pushing very hard to decontaminate land, roads, and buildings throughout Fukushima Prefecture, 105 cities, towns, and villages. Thousands of workers collect toxic material into enormous black one-ton bags, thereby accumulating gigantic geometric structures of bags throughout the landscape, looking evermore like the foreground of iconic ancient temples. Alarmingly, Greenpeace found large caches of hidden buried toxic black bags. Over time, it is likely the bags will rot away with radioactivity seeping into groundwater.